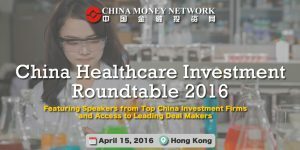 Hong Kong, March 1, 2016 /ChinaNewswire.com/ - China Money Network is pleased to announce that the upcoming China Healthcare Investment Roundtable, to be held on 15 April 2016 in Hong Kong, will gather some of the biggest and most successful investors in China. This event organized by China Money Network is one of a series of roundtables to be held this year in the Greater China region, focusing on themes including clean tech investment, real estate investment, distressed debt investment, and long short equity. The China Healthcare Investment Roundtable will gather the brightest minds from the industry, including head of healthcare at Bain Capital and Warburg Pincus, Min Li and Min Fang, as well as former head of China at Och-Ziff Capital, Frank Yu, who just launched his own healthcare-focused investment firm Ally Bridge Group. The roundtable also features Qiming Venture Partner's head of healthcare Nisa Leung and Dr. Zhi Yang, founder of BVCF, formerly BioVeda China Fund, one of the earliest investment firms dedicated to China's life science sector. China's healthcare sector, on track to reach over RMB8 trillion (US$1.23 trillion) in 2020, remains one of the most attractive sectors for private equity and venture investors in 2015. Investments reached US$3.5 billion last year, up 151% year-on-year, driven by strong growth in the pharmaceuticals and biotechnology segment. During the luncheon roundtable, featured speakers will discuss topics including where they see the best opportunities in China's healthcare sector, and the private equity investment strategies that work best in China. The panel discussion will also cover subjects of opportunities and challenges posed by Internet technology to the healthcare sector, as well as industry outlooks and technological innovation that will reshape healthcare. The China Healthcare Investment Roundtable will be held from noon to 2:30pm on Friday, April 15, 2016 at the 22nd floor in the CITIC Tower, 1 Tim Mei Avenue in Admiralty, Hong Kong. Please click here to register now. Seats are limited. Before founding healthcare-focused investment firm Ally Bridge Group, Frank Yu was head of China Investments at Och-Ziff Capital Management, one of the world's largest alternative asset managers with over US$43 billion under management. Before Och-Ziff, he was a managing director at Goldman Sachs Hong Kong. Dr. Yang founded BioVeda China Fund in 2005, in one of the earliest dedicated firms to focus on venture investments in life sciences in China. He has invested dozens of companies and secured many successful exits, as well as co-founding seven companies. As an accomplished life scientist, he was also the principle inventor of more than ten patents. Nisa Leung, as Qiming Venture Partners' head of healthcare investments, is one of the most active and successful venture capitalist in China's healthcare sector. She has invested over RMB4 billion in the healthcare sector in China during the past seven years, including Nurotron Biotechnology and Berry Genomics. Min Fang joined Warburg Pincus in 2007 and focuses on investments in the healthcare sector in Asia. Mr. Fang is a director of Beijing Amcare Women's and Children's Hospital Group, China Biologic Products (NASDAQ: CBPO) and Evercare (Beijing) Holding Group. China Money Network was founded in 2011 by a team led by Nina Xiang, a veteran financial journalist dedicated to building an online and offline community exclusively for professional investors focused on investing in China. Headquartered in Hong Kong with operations in Beijing and Shanghai, China Money Network's products include real-time news briefs at ChinaMoneyNetwork.com syndicated to dozens of media; a top-rated audio/video podcast available for mobile devices; an alternative investment manager database in China; a robust series of high-level investment events; weekly investment e-newsletters; as well as a full companion Chinese-language site ZhongguoJinrongTouziWang.com. In addition, China Money Network has a strong social media presence, with up to one million followers across both English and Chinese language social networking channels. China Money Network's target audience includes overseas institutional investors; China-centric professional investors, capital markets professionals, and senior company executives.